Nationalisation and privatisation: RMs for ever? It is not often that one associates the Conservative government of Mrs Thatcher with Nationalisation. But it was a tool that they used several times to remove power from their political enemies, and to pave the way for the sell-off to their supporters. London Transport, controlled by the GLC, was one of these cases. The ink was barely a couple of days old on the legislation in June 1984 when Nicholas Ridley (the Transport Secretary) surprised everyone by an overnight takeover of London Transport. London Regional Transport was the new body controlling it for the government, with a remit to halve the subsidy. This was to be achieved partly through competitive tendering for the provision of services, with LRT phasing out its operations side. The first impact on the Routemasters was a speeding up of the one-person-operated (opo) conversion process, with Titans and Metrobuses taking over RM routes. RMs were unaffected by the first round of tenders in 1984, which ignored crewed routes. 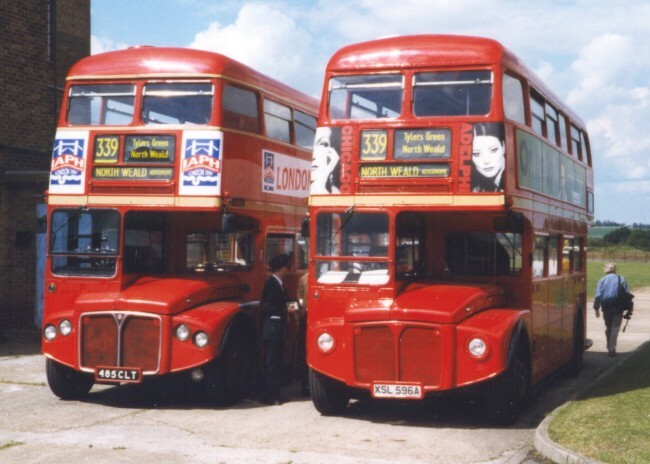 From all Fools Day in 1985 London Buses Ltd took over the operating business as a wholly-owned subsidiary of LRT, with the buses and garages. 370 more RMs were disposed of by the end of 1985 as the Titan and Metrobus tide rolled forwards, and this pattern continued through the next few years. The pattern of services changed somewhat as tendering gathered momentum and garages closed, as the operating units closed or failed commercially. The RMLs were leading a charmed life - on inner London high density routes with no prospect of opo working - and were very much in demand. The fleet losses were primarily among the non-standard RM classes and in the standard "short" RMs, that were more common now in the suburbs where opo and the advent of "low-cost units" (ie bus operating units with substandard pay and conditions) were becoming the norm under the even stricter regime, and where other companies were winning contracts to operate old Central Area routes. Even Central London was not immune from the changes: route 24, where RMLs and Atlanteans had competed to demonstrate the superiority of the former, was awarded in 1988 to Grey-Green to operate using double-decker Volvo Citybuses. London's buses were no longer all red! The appearance of the RMs became steadily more run-down as the decade progressed: painting cost money and was now the responsibility of local managers rather than a central administration. 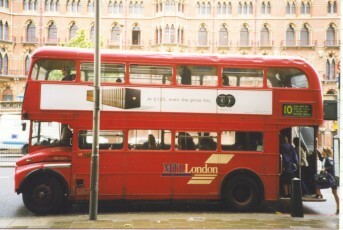 Advertising frames made an appearance, enabling quick changes of advertising without wrecking the sides of the buses. These included shaped offside frames that covered the staircase area. 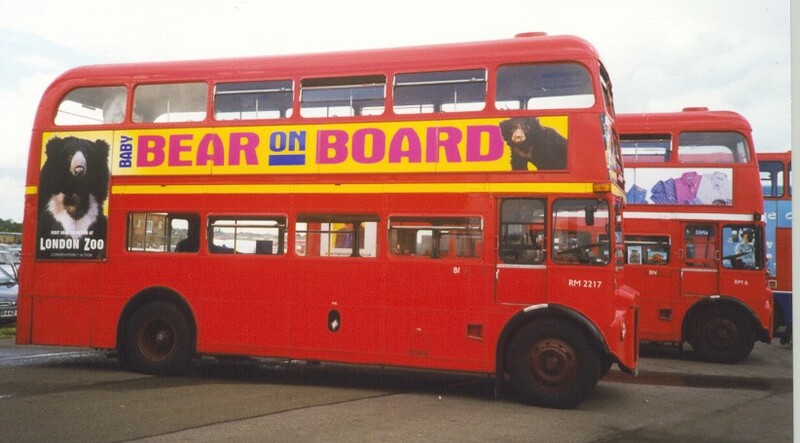 London Buses also introduced its new roundel, with a yellow cross-bar: the grey skirts of the rest of the fleet did not suit the RMs and were abandoned, apart from the lifeguards. One change that affected the appearance in a major way was route-branding, with the front advertising panels featuring the route-number large in black on a yellow ground. This was applied to fifteen "tourist routes" initially. With some routes and operating units it faded out, but with others it has persisted. As the decade wore on it became apparent that no RML replacement was on the horizon but that the RMs were gradually disappearing - in London. But the London logic of faster operation with crews and open platforms was seized upon by non-London operators once the desperate scramble of de-regulation fastened upon the bus scene outside London. RMs were suddenly in demand on the domestic secondhand market! Routemaster operation was trumpeted loudly around the land. It did not always last: LT had had difficulties finding spares to keep these still relatively sophisticated vehicles going, and other operators discovered the same problems without the long experience of the type. 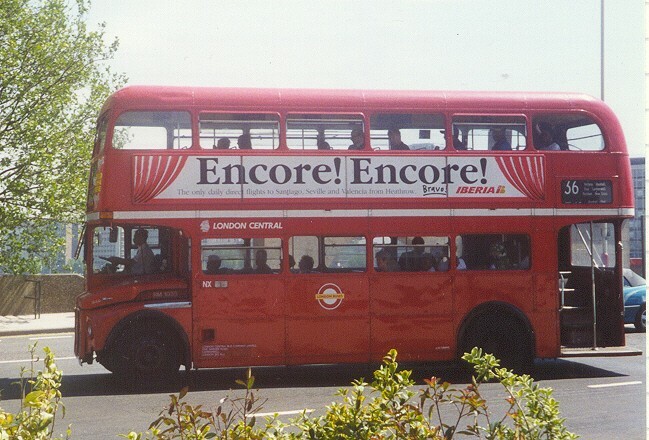 Back in London the Central business was divided into 11 smaller businesses, which hired their assets from London Buses Ltd, from 1st April 1989. The local bus - units were re-incorporated into these businesses, apart from Westlink, which was outside the London boundary and thus subject to de-regulation anyway. It had been made clear that these companies would be available for sale to acceptable owners, but this took until late 1994 to happen. RMs continued to disappear in the early nineties. New types of bus displaced some of them, SP class Spectra doubledeckers and LA class Lance singledeckers for instance. 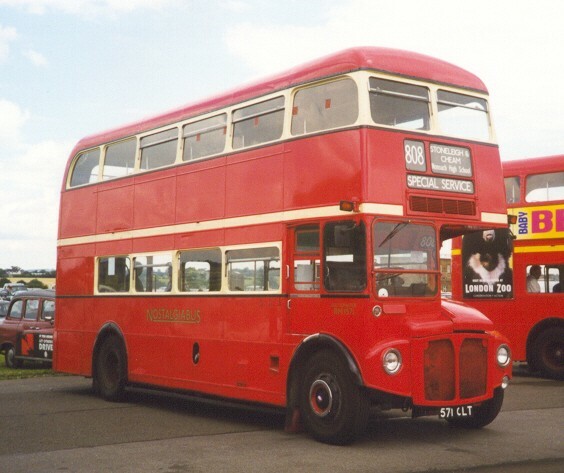 By the time that the London bus companies started to be sold there were few of them that actually operated standard RMs, although several had RMLs, and quite a few had the odd RM as a trainer or showbus. CentreWest was sold in September 1994, and included four RMs which were sold in the second half of 1995. (RM944, 1948, 2103, 2181). Leaside Buses was sold to the Cowie Group in September 1994, and held just one standard RM. RM5 is the Clapton showbus, and has been kept variously for special occasions or for normal service on route 38 (Victoria to Clapton Pond). 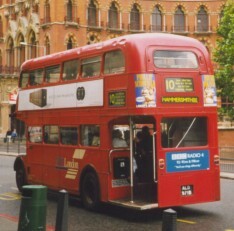 It is painted in London Transport red, with a cream band and gold underlined London Transport fleetname. the company is now part of the Arriva empire. RM295, RM736 and RM1330 were acquired when the LT Reserve fleet was disbanded in 1997, and another four were transferred from Brixton. London Central was sold to Go-Ahead group plc in September 1994. 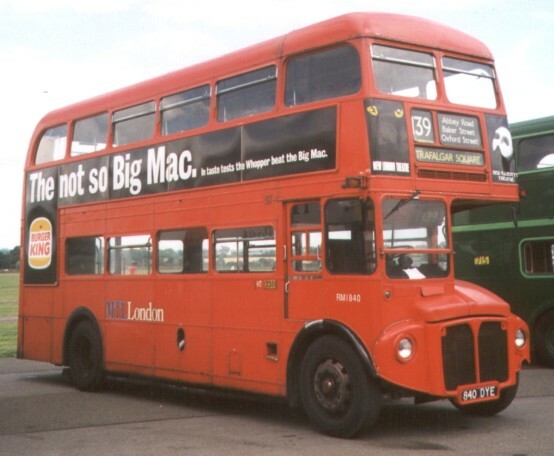 As well as RMLs there were 46 RMs for route 36 (Lewisham to Queens Park), allocated to New Cross. These included RM9, which was used as a partial refurbishment prototype early in 1995: the other RMs received new flooring, fluorescent lighting and interior redecoration, and an external repaint and route 36 branding. RM1033 on a blazing June day in 1994, working on route 36 for London Central. After privatisation it continued with this company on the 36. RM2022,  RM2051,  RM2106,  RM2109,  RM2128,  RM2151. Reaward of the contract for the 36 in early 2000, still using Routemasters, has prompted a process of refurbishment of the short RMs. They are receiving new floors, seats and lighting inside, with attendant repaint. This includes route branding, with blue "route boards" painted above the lower deck windows. The work is being carried out at a number of locations around the country during spring 2000. 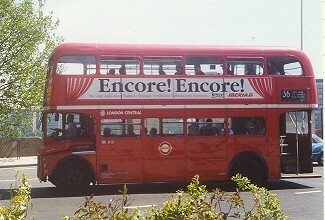 London General was sold to its managers in November 1994, and taken over by the Go-Ahead Group in May 1996. Since then there has been significantly closer working between London Central and London General. Although there was a significant fleet of RMLs there was just one RM: RM994. This had been refurbished in 1992. 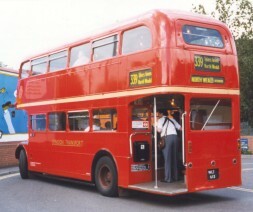 London United had no standard RMs when sold to a management team in November 1994. It has subsequently acquired some from the LT Reserve: RM 2033 and RM2078. 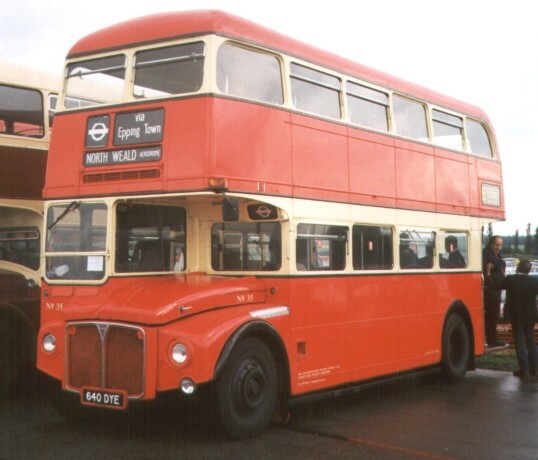 These are in London red with white bands, with the London United crest on the 'tween-decks and yellow fleet numbers in the usual places and also on the front nearside. RM2033 makes an appearance at Cobham Open Day, 1998, next to M1048 (also from London United). 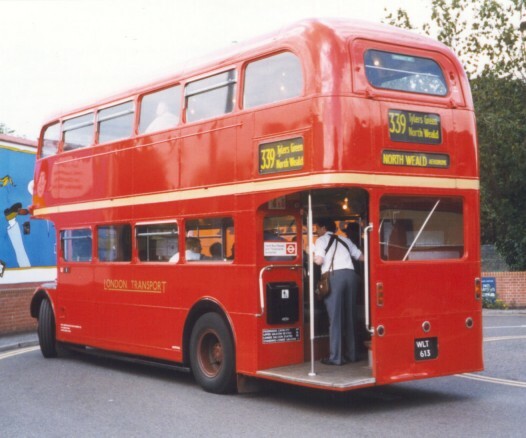 Metroline, sold to a management team in October 1994, had two odd RMs: RM664 is an open-top RM (one of the original conversions), fitted in April 93 with an RMC type rear, with AIR-operated doors. RM70 was a learner vehicle until withdrawn in 1995. Metroline's Routemasters have a blue skirt over the bottom panel, with a white cheat line and white cantrail. MTL London was formed from London Northern when MTL Holdings bought it in October 1994. They were - and are, a significant user of standard RMs, initially on routes 139 (Trafalgar Square to Golders Green) and 10 (Hammersmith to Archway). Their fleet included 26 standard RMs, which were repainted in unrelieved red from November 1995. They also lost the RM prefix to their fleet numbers. RM1971 at St Pancras on 26th June 1998, on route 10, which RMs share with RMLs. During 1998 the RMs on route 139 have been displaced by low-floor Dart single-deckers with Marshall bodies, the DML class, and a considerable number of the RMs has been disposed of. 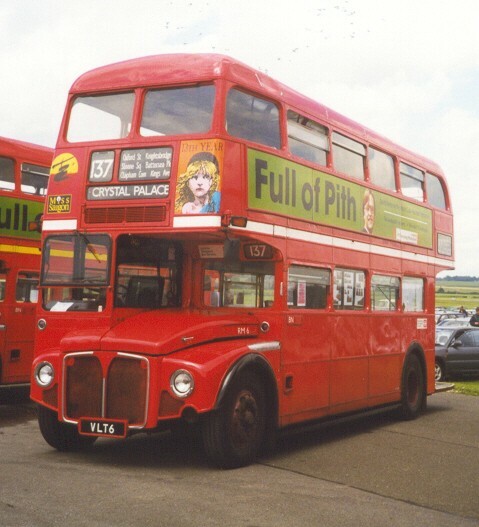 The changing order on the 139: RM1840 is out, and is now in preservation (North Weald 30th June 1998); DML10 is in (28th June 1998, Trafalgar Square). MTL sold their London operation to Metroline in 1998, and the new owners are gradually repainting the drab fleet in their brighter red with blue skirt livery. 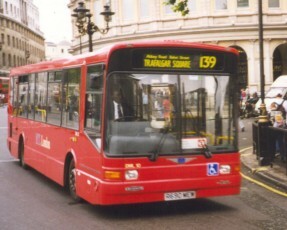 South London was sold to the Cowie Group in December 1994, and included 31 standard RMs (Iveco engined in 1993) for route 137 (Streatham Hill to Oxford Circus) and route 159 (Streatham Garage to Baker Street). Most of the RMs were repainted into a dedicated route 159 livery, of red and cream with a route line along the side advert panels and front number branding. They were also fitted with fluorescent lighting, bright non-slip handrail coatings, new stair-tread edges and new rear light clusters. 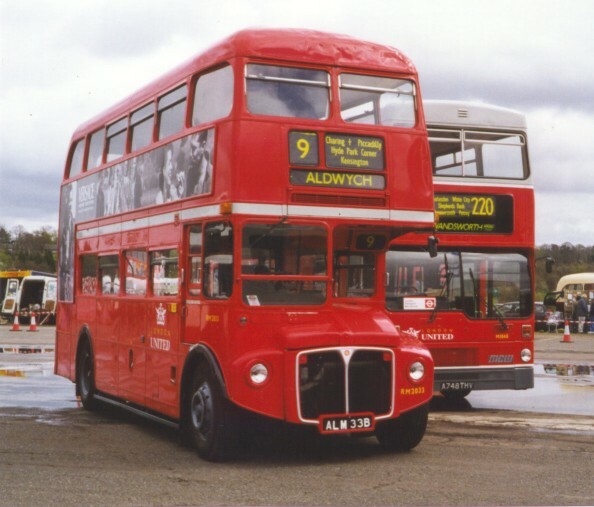 The government requirement, imposed through tender conditions, for Central London buses to be at least 80% red, has seen the demise of the bold red and cream, and the return to red with a white stripe, together with Arriva fleetnames during 1998. There have been some transfers between the two London Cowie/Arriva companies, and RM385 was acquired from the LT Reserve fleet when it was disbanded in 1997. RM2217, the last of the standard Routemasters, still operating for Arriva South London, at North Weald rally in 1998. It wears the intermediate livery of red with Cowie yellow band, adopted between the red and cream and Arriva liveries. Beside RM2217 is RM6, wearing the newer white band. Stagecoach East London was formed when Stagecoach bought East London in September 1994. 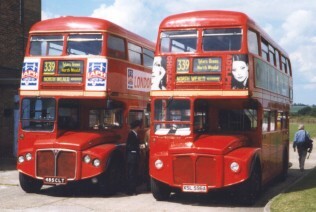 The sale included a pair of standard RMs amongst the miscellany of Routemasters belonging to East London. The company adopted a traditional style for their London operations, the Routemasters receiving red with cream bands and gold fleetnames. RM1527 has become perhaps the most widely filmed RM ever, as the bus that appears in BBC's Eastenders television soap opera (so I'm told). RM613, the Upton Park showbus, is kept in beautiful condition with London Transport fleetnames. Other standard RMs have returned to East London from other parts of the Stagecoach empire, including RM 980, RM1289 and RM1599. 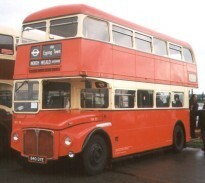 RM1289, standing beside RMC1485 at North Weald aerodrome, is one of the RMs repatriated by Stagecoach from Scotland. 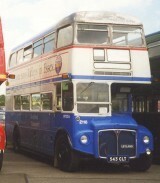 RM613, seen on full lock negotiating the roundabout at Epping Station, has long been the Upton Park showbus. All three were on duty at the 1998 north Weald Rally, bringing enthusiasts from London and operating shuttles to and from Epping station. RM613,   RM980*   RM1289*   RM1527,   RM1599*. 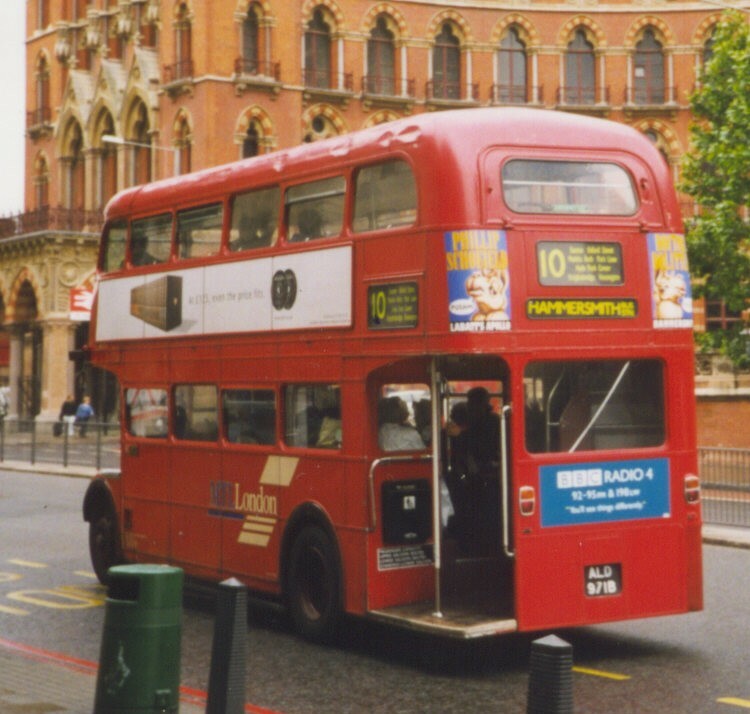 London Coaches, based at Wandsworth Garage, has a number of RMs for its sightseeing business. These have all been re-engineered in some way: open-tops, convertible tops, platform doors, extra bays, wheelchair lifts.. and will be dealt with in the next section. The closest to standard is RM 545 which was re-engined with a DAF engine in April 1988. The business was the first privatised, in May 1992. It quickly adopted a bold red and white livery, with display placards along the sides proclaiming "The Original London Sightseeing Tour". A number of other companies operate standard RMs within the old London Transport area. 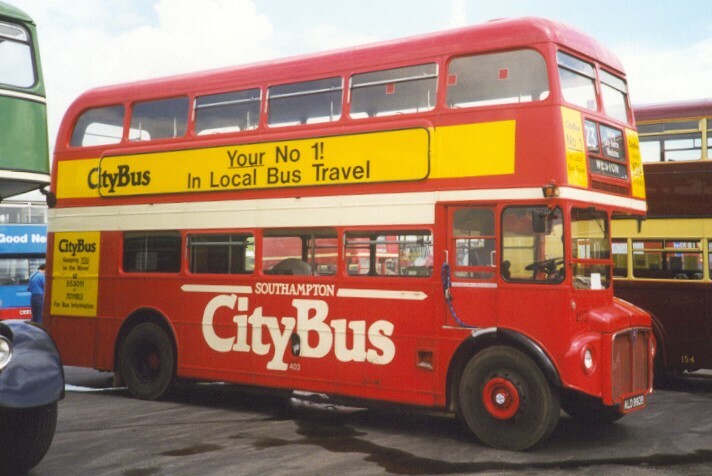 London and Country acquired RM1183 from Southend Transport in late 1993, and used it initially on Surrey schools route 418, still in Southend livery. It graduated to Christmas shopper work on December Saturdays, on routes 406/408. Full London & Country livery was applied as a Christmas present, and the glorious machine, in probably the finest livery carried by an RM, operated a spectrum of Leatherhead-based routes during 1994: 406, 408, 410, 414 and 473, these including the Surrey Hills leisure buses. After an engine breakdown at the end of 1994 it was re-engined and repainted - this time into Lincoln green, making it only the second RM to wear Country green in service. 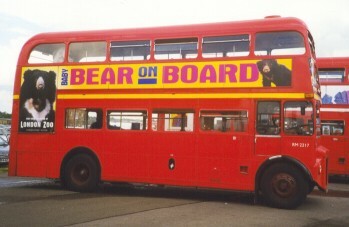 It was sold on to Nostalgiabus for use, still in Country green, on their 306 service (Kingston - Epsom), but was destroyed by arson in December 1997. Timebus Travel started a commercial service in the deregulated Hertfordshire town of St.Albans (old Country Area) in March 1993, with RM2180. This had previously been in service with Burnley & Pendle, as had RM2156, the next RM. RM1571 was borrowed on long-term loan, and RM2198 came out of preservation to act as backup vehicle. The group of vehicles operated a couple of routes in the Watford area. Nostalgiabus was operating with private hires and tour work, but by the end of 1997 was operating a commercial 306 service along part of the old 406 route, using some ex-Timebus vehicles in Nostalgiabus livery, plus ex-London & Country RM1183. This service ceased during 1998. 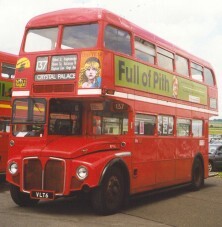 RM1571 in Nostalgiabus livery at North Weald in June 1998. Blue Triangle of Rainham operate services in their area, plus "Official London Sightseeing Tour"s using mainly AEC vehicles. They also deal in buses. They acquired RM933 with Haven Coaches, and also RMs 799 and RM245, but all these buses had ceased operation by 1996. RM 298,   RM428*   RM704*   RM1776. Capital Citybus used RM429 as a reserve bus from their Dagenham garage, and repainted it from Ensign blue/silver to their overall yellow with LARGE red logos. 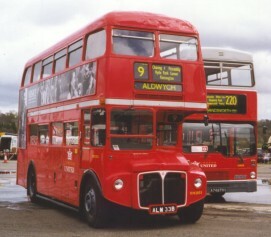 It has subsequently moved on, through a variety of other liveries, to preservation at the Routemaster Heritage Centre. 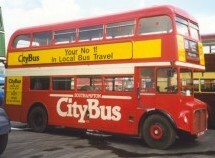 Its place in the Capital Citybus hire fleet was taken by open-top RM121, and standard RM120 and RM1913. These are nominally in red livery, but available for contract hire repainted as required. Metrobus For the year 2000 Bluebell Railway season Metrobus intended operating preserved RMC1490 on its regular 473 service between East Grinstead and Kingscote Station. The privately preserved RM was repainted into Metrobus colours for the operation, but suffered a severe breakdown before operation commenced. There have been other RM operators in the UK and elsewhere. Notable home users include Stagecoach, Strathclyde, Strathtay and A1 in Scotland, Southend, Blackpool, Bournemouth RM, Southampton Citybus, Burnley and Pendle, Greater Manchester, Cumberland, United Counties, East Yorkshire..... and of course Reading Mainline, which continued to be a significant user until mid 2000. Many of its buses, plus some from Halifax, Capital Citybus and elswhere were then bought by London Buses for use in a refurbishment float - but that is in part7. 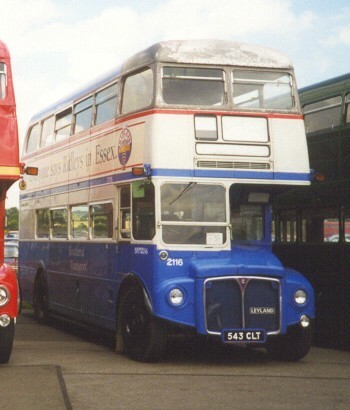 A selection of other operators, seen at North Weald in June 1998: RM1993, then preserved, operated for Southampton Citybus as number 403; RM1543, preserved and undergoing restoration, was Southend 2116; and RM1640 was still with Reading Mainline (#35), and was operating to and from the rally. A very large number of standard RMs still exist, both in the UK and around the globe. There are so many survivors that I cannot maintain a simple up-to-date list, as it changes too often. But I do try to keep the vehicle history pages updated, so please try there. If you e-mail me about sightings and news I shall be very pleased. Photographic references are on a separate page. So is the Fleet History.